My association with Bill Kristol, editor of The Weekly Standard goes back some twenty-five years to the time we served together on Vice President Dan Quayle’s staff. Kristol was Quayle’s chief of staff and one of the few conservative voices in the upper reaches of the George H.W. Bush White House. I admired Kristol’s willingness to push back against the efforts of the Bush White House staff to dismantle Reaganism and to empower conservatives on Quayle’s staff, such as David M. McIntosh, (a founder of the Federalist Society and later Congressman from Indiana) to advance conservative policy. 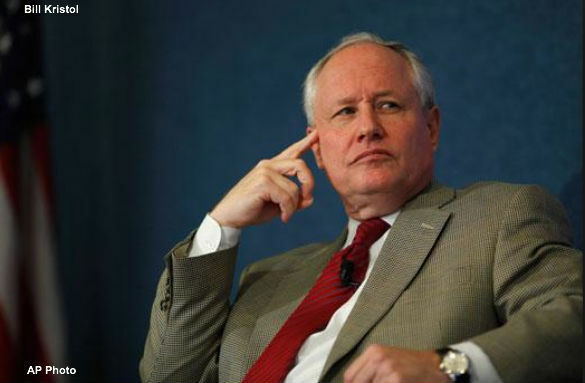 One of Bill Kristol’s great strengths is the ability to put conservative policy into practical political terms – to get it out of the ring binder of wonky policy papers and into the voter motivating sound bite on talk radio, the op-ed pages and FOX News. Kristol’s daily faxes with talking points and analysis of what was going on during the Hillarycare debate back in the early days of Bill Clinton’s first term were arguably the glue that held the conservative opposition together and helped ensure that Capitol Hill Republicans did not cave-in and compromise to move a bill as the Senate’s establishment Republican Leader Bob Dole was certainly prepared to do. So when Bill Kristol pens an article for The Weekly Standard, even if you don’t agree with his interventionist-oriented foreign policy views, conservatives and Republicans should take notice. Submitted by ckienast on Wed, 01/29/2014 - 15:40. Sooner or later, we will need to address the issue of what to do with most of the illegal immigrants already here - especially, the children who were brought here illegally. And I, personally, would like to see that these illegal immigrants receive some type of legal status - not citizenship - but something like amnesty with green card status so that they can stay and work in the United States and pay taxes, etc.